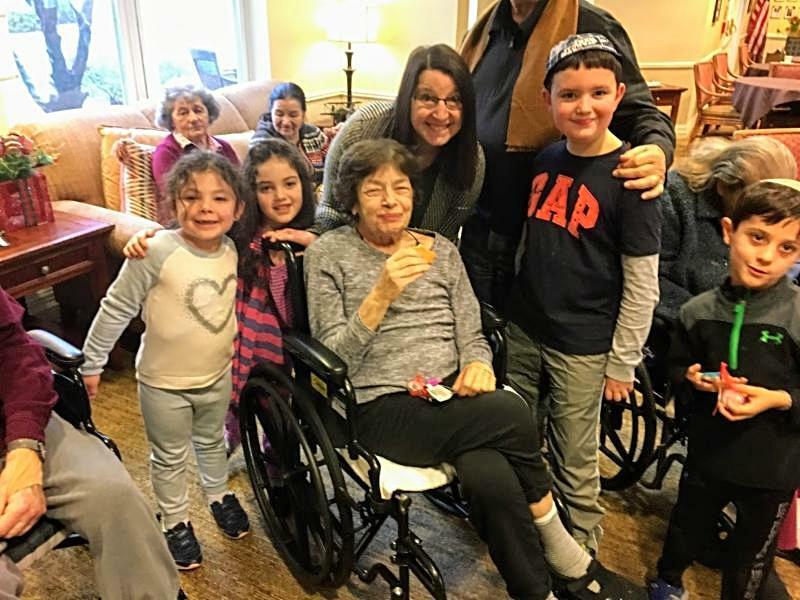 Click here to see my Hanukkah gift to our staff, "The Happiest Shul on Earth"
Did you have a chance to listen to Cantor Fishman's Shabbat album, which was sent to the congregation as a Hanukkah gift via email this week? Now we can have those lovely Shabbat melodies in our head all week long! A never-ending Shabbat sounds like a good idea to me. Also a special thank you to Beth Styles for her assistance on the album, and her continued help at services. I hope you can join us for tonight's dinner and service. Note that the service begins at the early time of 7:00 PM (dinner's at 5:45) and our students will be participating. We also welcome BBYO teens to our service tonight. Also, once again, I want to thank those who support our morning minyan. We continue to have at least 10 every day - some days many more - and this is not simply because we have an inordinate number of people in mourning right now, who have committed to being here regularly. (We should give our little club a name - but I'm thinking that "Dead Parent's Society" might be a little unnerving). In fact, it's those who are not currently in mourning who are the real heroes here. Like so many in our congregation, they understand the supreme power of "just showing up." It's that manner of kindness that is bringing large numbers of new congregants to our door. Which reminds me, if you look around at services this evening and see someone who looks like a visitor, a smile and 'Shabbat Shalom" will go a long way! And if someone is sitting alone, they shouldn't be. 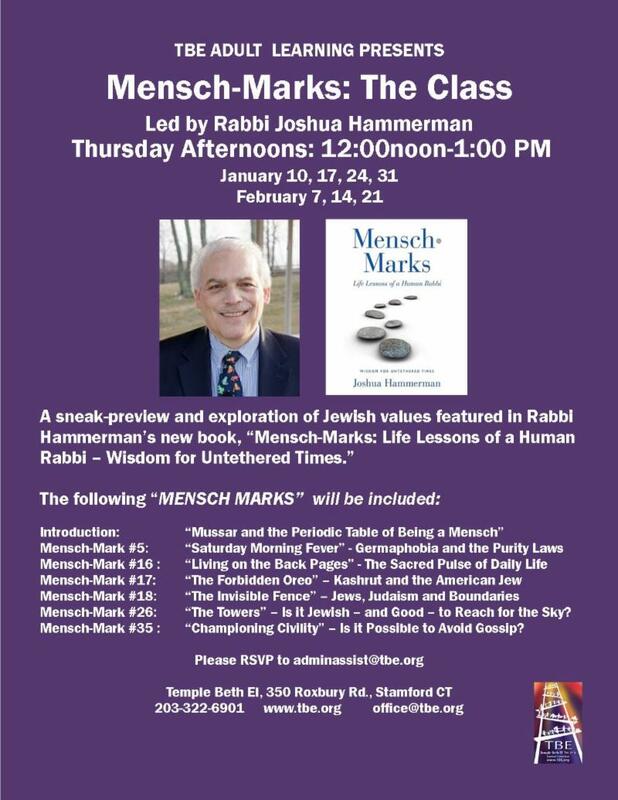 Finally see the flyer at the bottom for info on a new adult ed class beginning in January, based on my upcoming book, Mensch·Marks: Life Lessons of a Human Rabbi - Wisdom for Untethered Times. 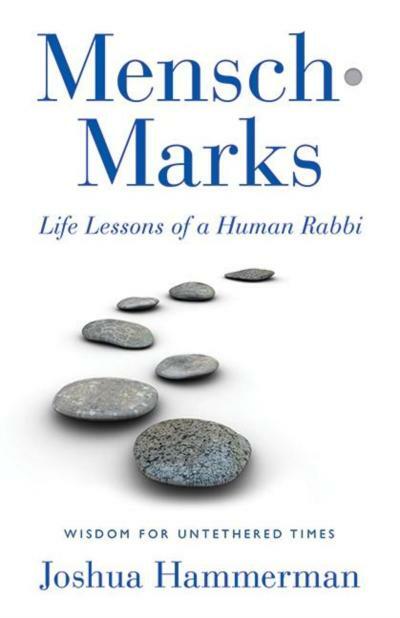 This weekend, Rosh Hodesh ushers in the new month of Tevet, which combines with Hanukkah and Shabbat to give us the rare trifecta - we read from three Torahs on Shabbat morning (which is partly why, to simplify matters, services will be in the chapel). It is also the darkest Shabbat of the year - not necessarily the longest night, but the deepestnight. The darkest one. No moon in the sky combined with a very short day makes this the darkest Shabbat and just about the darkest night. 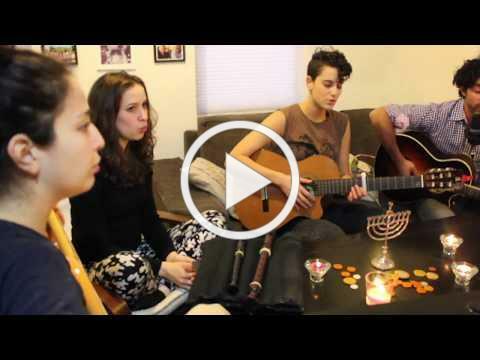 A popular Israeli Hanukkah song is entitled, "Banu Choshech L'garesh." In our hands, light and fire. And all of us together - an immense light! "Ba'nu choshekh" depicts what a lot of people imagine when they think about Hanukkah - we are celebrating the triumph of light over darkness. This imagery can be inspiring but also problematic. For one thing, we use darkness to mean ignorance. We typically depict our own beliefs from the perspective of light. Politically, that's always been a framework one people uses to justify colonizing and erasing another people's culture, as the Europeans did when they brought the "light" of Christian civilization to the "dark" continent of Africa. The Hellenists of the Hanukkah story also thought of themselves as bringing light to benighted peoples like the Jews, who were held captive by their failed god(s). Western civilization has all but worshiped light as a symbol of God. In the process of extolling light, we have lost touch with the immanence of God, with what we call Shekhinah. To speak in theological poetry, the darkness of the Shekhinah is the womb-space that gives birth to the world. The Zohar calls Shekhinah the "beautiful maiden that has no eyes" - meaning, having no light of her own, nurturing us by feeding us darkness, mystery, yearning. Much like the moon, which reflects light but doesn't generate it. This is the darkness in which the seed begins to grow, and the baby starts to form. Darkness is the Earth, that brings growth and sustenance to all. If we ever needed to honor darkness, it's now, when we need to fight for the Earth. So what should we be teaching about the "festival of lights"? If darkness nurtures the light, then Hanukkah is a time when we are planting seeds of light. That is what the tiny flames of the Hanukkah candles really look like, after all. 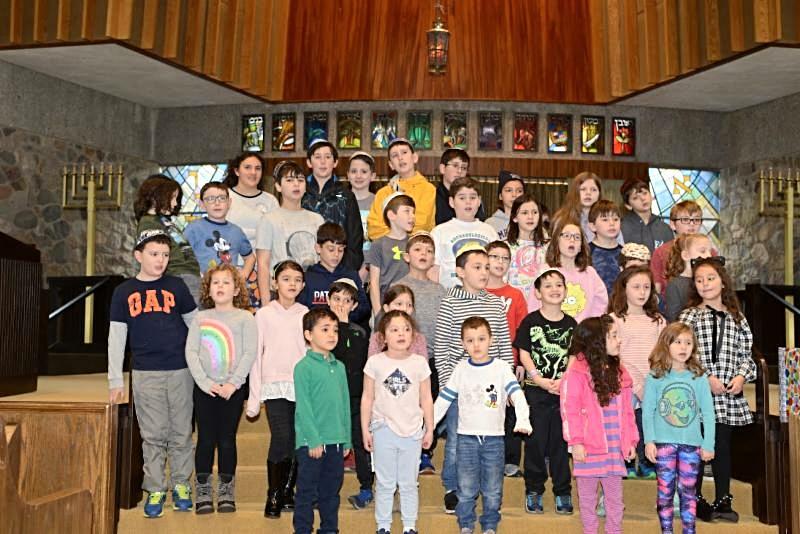 Rabbi David Seidenberg points out that no one sits in front of the menorah thinking, "I can't wait for these candles to grow so bright that there's no more darkness." 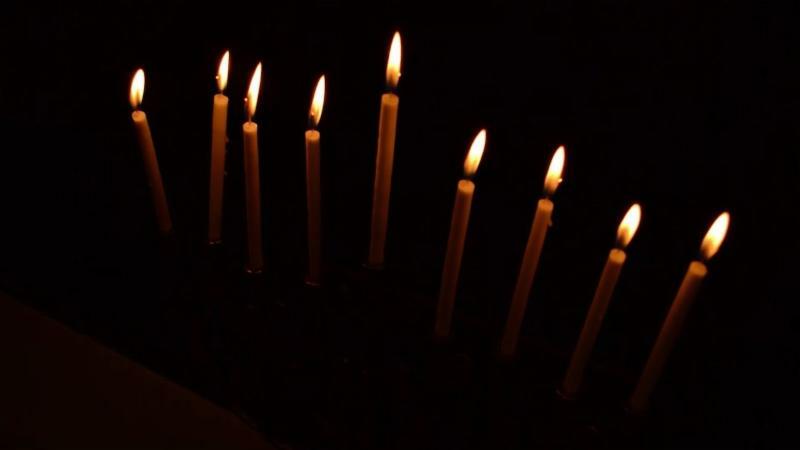 Darkness is the condition that makes the candles beautiful and sweet. Light has its greatest significance only where there is darkness. In total darkness, a tiny candle can dazzle the eye. As nature writer Henry Beston has written, "With lights and ever more light we drive the holiness of the night ever back to the forests and the sea; the little villages, the crossroads even, will have none of it. Are modern folk perhaps afraid of the mystery of infinite space, the austerity of stars? Having made themselves at home in a civilization obsessed with power, which explains its whole world in terms of energy, do they fear at night for their dull acquiescences and the patterns of their beliefs? Be that answer as it will, today's civilization is full of people who do not have the slightest notion of the character and poetry of the night, who have never seen night." 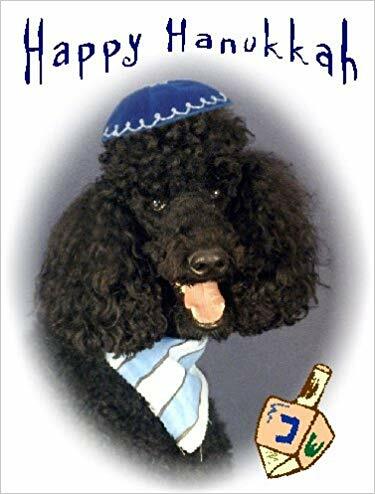 We can understand the meaning of Hanukkah starting from that experience. Hanukkah should be a celebration and savoring of the darkness, as well as an appreciation of the turning of the light. We still need the story of the oil - maybe now more than ever, when we need to think about using energy in the purest way possible. But if there's an illusion that needs to go, it's the idea that we are the fiery light fighting the darkness. The story we need now is about winter darkness nurturing the light. Shabbat Shalom, happy Hanukkah and a good month of Tevet!